Suited for industrial, moisture, dust and chemical laden gas samples, with sample conditioning, drying and filtration. Modular construction with many add-ons available, allow for individual model configuration according to requirements. A Wide range of electrochemical, NDIR, Thermal conductive, PID to choose from, with different ranges and accuracies to choose from. Up to 8 sensors in an extreme, unique configuration. Large display with backlight, 4 lines x 20 charactersDifferent gas dryers to suit requirements. Compact, Split and Twin split configurations. Data-logger with SD card for data collection. Analogue outputs (both current and voltage) to control external devices. Digital and analogue inputs to pass signals from external devices, to trigger maMoS actions. 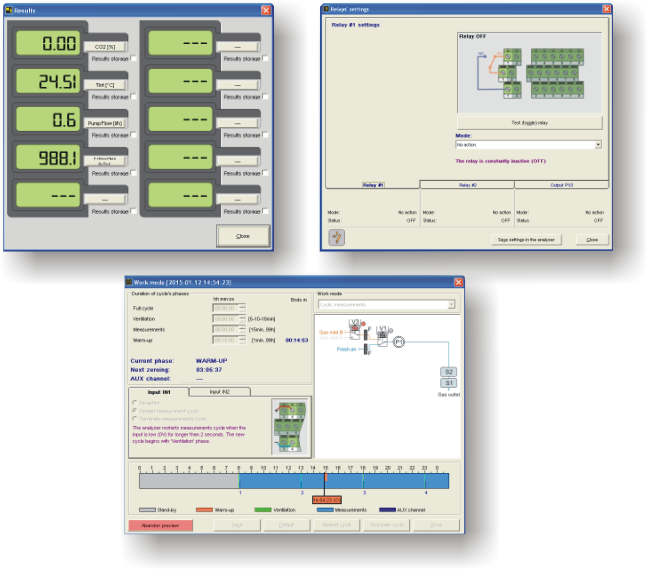 Communication with PC via different interfaces (USB, LAN, RS485 and MODBUS). Different work modes to select from (continuous measurements, work with scheduler, measurements triggered with digital input, “work in-turns” - allows multiple locations to be monitored). Heated hoses. Standard lengths: 3m, 5m and 8m for 115VAC and 230VAC supply. Other hoses upon request. 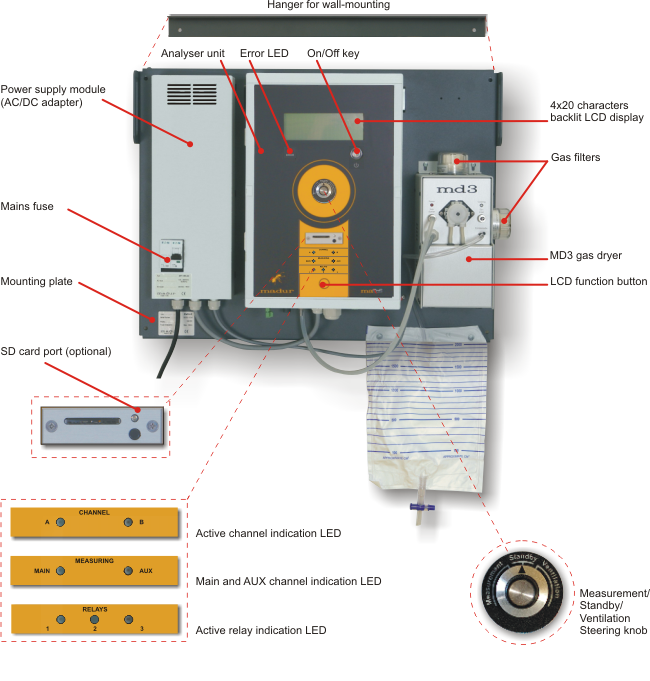 Compact configuration - analyser with gas dryer on a common mounting plate, all installed near the measurement point. 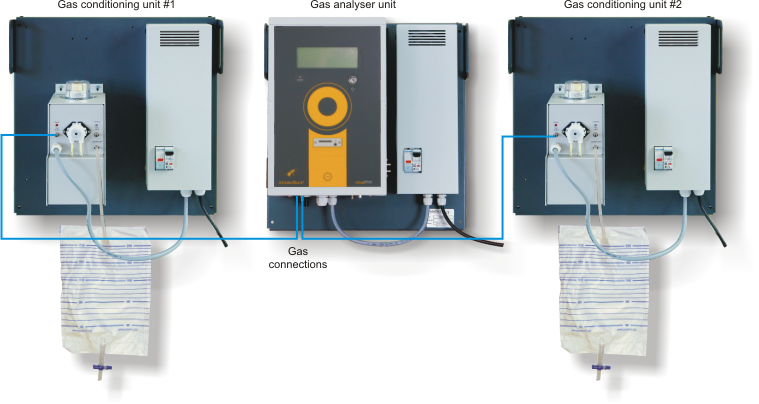 Split configuration - analyser and gas dryer are installed on separate mounting plates, each equipped with its own power supply module. 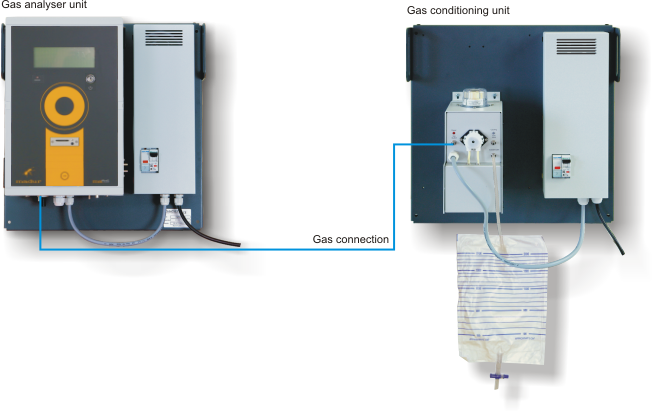 Gas dryer is installed near the measurement point, analyser can be installed at a distance from the dryer. Twin-split configuration with one dryer mounted on a separate plate. Twin split configuration - this version is based on compact configuration, but one MD3 dryer with its own power supply is added on a separate mounting plate. Allows measurements from two different locations (each dryer is installed near the measurement place). maMoS measures in turns - one cycle per location. Twin split configuration - analyser and two gas dryers, each on its own mounting plate, each equipped with a power supply module. Allows measurement from two different locations (each dryer is installed near the measurement place). maMoS measures in turns - one cycle per location. 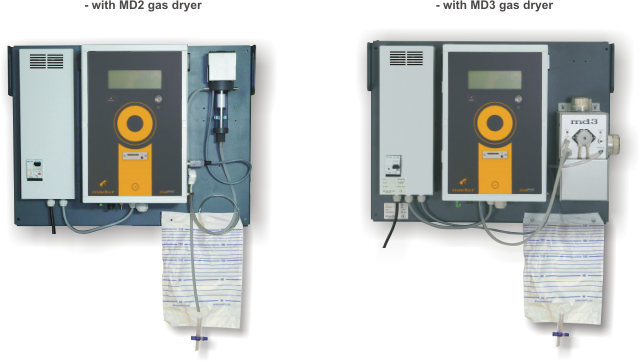 Drawing shows analyser in a compact configuration with a MD3 condensation dryer. 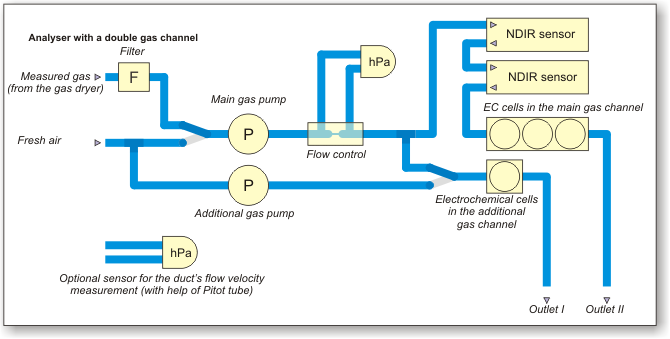 The second (additional) gas channel is enabled for a short time duration. 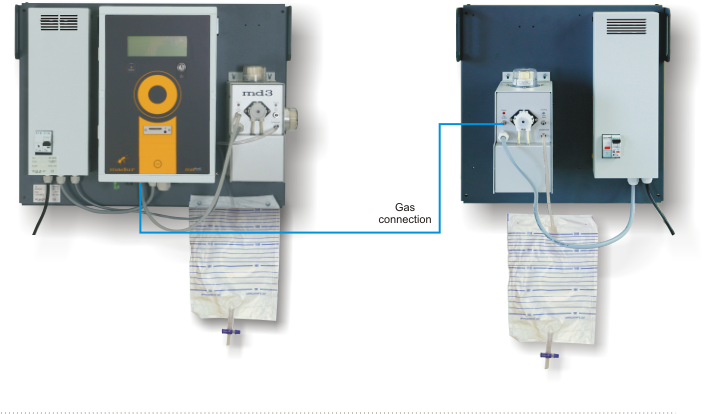 The additional gas channel is dedicated to the ”fragile” sensors, where they are protected against extended gas exposure, prolonging their life span. 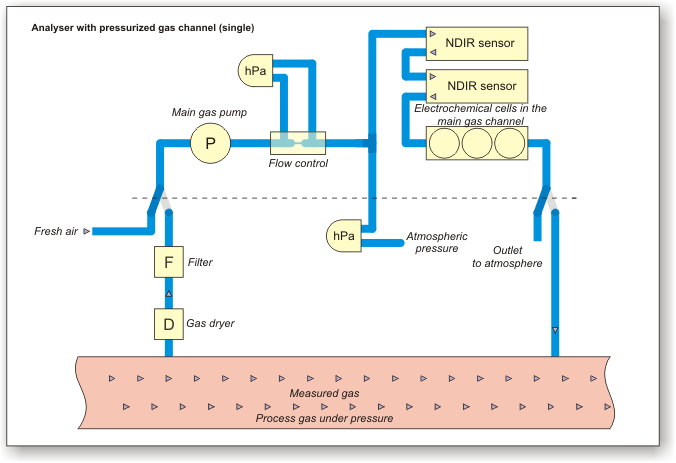 Bio-measurement is a typical application for the double gas channel configuration - the primary gas channel holds sensors CO2, CH4, O2, and the additional gas channel holds the H2S sensor that is recognised as a fragile one.